Whether you spend one night in this charming riverside city or several, my insider tips should help you decide where to stay in Coimbra. I’ve selected the best Coimbra hotels and apartments that I consider to be stylish, well-located and good value in three distinctly different parts of the city. As I’ve mentioned before, Coimbra makes a great base for exploring central Portugal and deserves a couple of days just to explore the city itself – see this article for things to do in Coimbra. 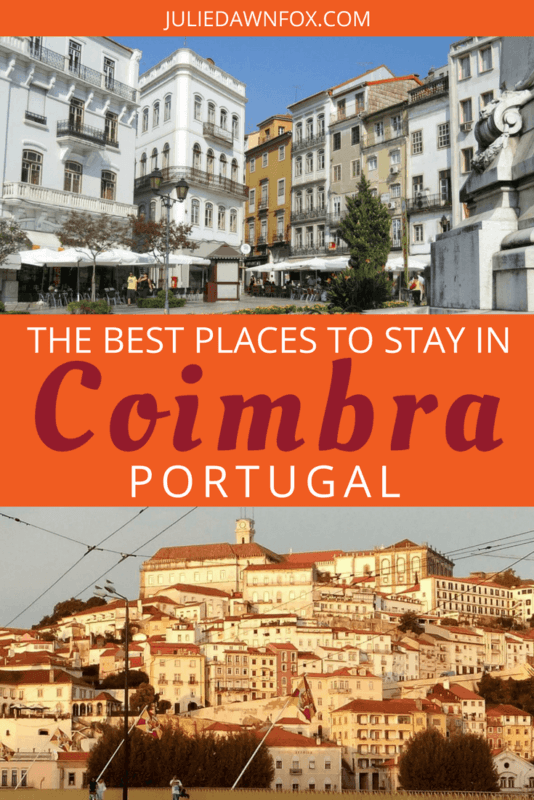 Find out the best places to stay in Coimbra depending on your interests and how you intend to get around. Alta means high so if you choose accommodation in this part of Coimbra, you’ll be at or near the top of the hill. There’s plenty to see and do here, such as the Botanical Gardens, the St. Sebastion aqueduct, Coimbra University and the Machado de Castro National Museum. There are also several restaurants and bars in this area. The slope towards downtown is steep if you go through the maze of narrow ancient streets but much more gentle if you take the wide, leafy Avenida Sá da Bandeira. It’s about a 20-minute walk and there are plenty of buses and taxis if you can’t face an uphill climb. Parking can be tricky in Alta so bear that in mind if you have a car. The newest addition to Coimbra’s 4-star hotel offering is more than welcome. Opposite the university, Sapienta Boutique Hotel takes books and learning as its theme and shares the seat of learning’s enviable views. It also has an onsite restaurant and outdoor seating area. Check availability and prices. I watched Casa de São Bento being renovated (it’s on the street I used to work in) and am happy to see what a great job they’ve done, both inside and out. On a quiet street within a few hundred metres of the sites mentioned above, this modern design guest house has a shared lounge and outdoor terrace. Parking can be problematic during the day but it gets easier after around 5 pm. See photos and prices. You’ll find another recently restored old house on the next road, again in an excellent location. AH33 offers studio apartments that accommodate up to 4 people but are perhaps better suited to 2. Don’t take one of the attic apartments – the ceilings are low and there’s no lift. Although these are self-catering apartments, the owners make sure your day gets off to a good start with a fresh breakfast delivered to your apartment each morning. Choose an apartment to suit your needs. Baixa means low, or downtown, and in Coimbra’s case it’s both. This is the area between the base of the hill and the Mondego River. The main shopping streets are here as are the city museum, Arco de Almedina, the gateway to the oldest part of the city, and the museum of the old city walls. Rua da Sofia is also part of Coimbra’s UNESCO World Heritage site, with colleges and convents belonging to the university. You’ve also got the two riverside parks, plenty of outdoor cafés and a wide choice of restaurants in this part of Coimbra. See this article for tips on where to eat and drink in Coimbra. Buses run from Largo da Portagem to the rest of the city and the small Coimbra-A station connects you to the intercity station of Coimbra-B on the edge of the city. If you’d prefer the additional facilities that a hotel has to offer, including indoor and outdoor pools and a spa, the most luxurious hotel in downtown Coimbra is the 4-star Vila Gale, although it’s a 10-minute walk into the main historical centre. Check prices and availability. Less luxurious but closer to the centre is Hotel Oslo, which has a rooftop terrace, free parking and pleasant modern decor so don’t be put off by the exterior. Try to get a room with a balcony. Santa Clara is the part of the city on the other side of the river and is home to the Santa Clara-a-Velha monastery, Convento São Francisco conference and cultural centre, Portugal dos Pequenitos (miniature Portuguese buildings), Quinta das Lágrimas gardens and golf course, a range of watersports, an outdoor swimming pool, a beer museum and a science exploratorium. You’ll find plenty of cafés and restaurants, a great ice cream parlour and my favourite café bar, Galeria Bar, in this part of Coimbra. My first choice for accommodation in Santa Clara is Coimbra’s only 5-star hotel, the luxurious, historical Quinta das Lágrimas. Part of it is inside the former palace although there is a more modern wing. If you’re interested in making use of the onsite spa, look for their spa package deals when booking. Click to check prices at this luxury historical hotel. The hotel and grounds are inextricably linked to the tragic love story of Pedro and Inês and one of the hotel’s two restaurants is named after this famous couple. It is a little far to walk into the city centre so you might want to drive or use taxis. For a more modern alternative, the bright 2-roomed guesthouse of ArchiSuites is ideal, and very close to the main bridge into the Baixa. If you don’t fancy any of the accommodation I’ve selected, try searching for alternatives on Booking.com or Hotels Combined. Note: I’ve written similar guides for Porto, Lisbon, the Algarve, Douro Valley and Sintra. Disclosure: The links on this page are affiliate links. This means that although the price you pay is not affected, I may receive a small commission if you book via these links. This will help support my blog and enable me to continue providing quality content for you. I’ve only been to the Azores, never mainland Portugal. Sounds like this would make a great road trip! I’ve never heard of Coimbra, but then, I’ve not yet been to Portugal. Thx so much for this great post, Julie, and Happy Holidays! Wey visited Coimbra on an shore excursion while we cruised on the Douro. I love the vitality of this university city. When we return, your guide will be invaluable. Hi Anita, fantastic! Do let me know when you’ve got dates so we can sort something out. As a knitter, I was delighted to find a wonderful yarn store in Coimbra — Bolas de Tons, near the University. She carried several Portuguese wools, as well as some other beautiful European yarns. I arrived just at closing but she graciously stayed open for me to do some shopping. I highly recommend this shop to other knitting visitors to Coimbra. Good to know, Marta. I had a go at crochet a few years ago but haven’t had the time for ages, sadly.